Agra is located on the banks of the Yamuna River in Uttar Pradesh. Agra is the capital of Mughal dynasty due to this reason Agra is famous for the Mughal architecture. Agra is the best place to see different historical monuments which reflects the architectural style of Mughal dynasty. Agra means the first remember-able place is the Taj Mahal. It is the best place to see the love of Shah Jahan towards his queen Mumtaz. It was spotted as UNESCO World Heritage site in 1983. Taj Mahal is the best place to see the Mughal architecture. The construction was completely made of white marble. Taj Mahal looks in different modes during Sunrise and Sunset. When you visit Taj Mahal never forget to visit Taj Mahal during Full Moon day. It is the best experience of viewing Taj Mahal during Full Moon Day is different from normal days. The best time to visit Taj Mahal is in between October to March. The best way to visit Taj is via Maharaja Express Luxury Train that will provide you royal experience. Entry Fee: 20Rs per Indians and 750Rs for Foreigners. Timings: Sunrise to Sunset except for Friday. Night Tours permitted between 8:30 pm to 12:30 am with a permit of 30 minutes. 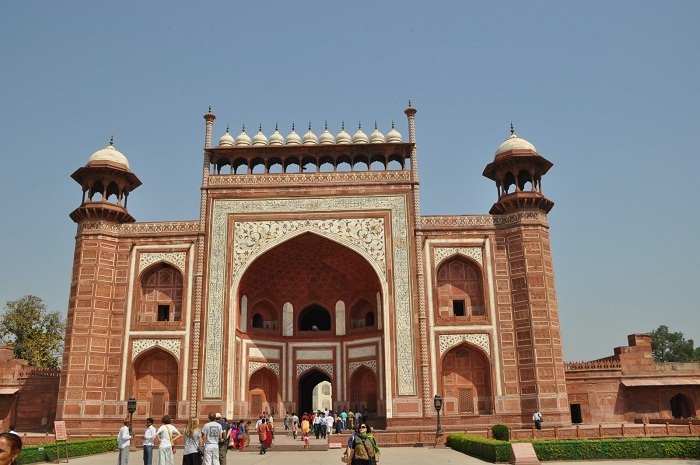 Fatehpur Sikri is also a part of the Agra district and once it was the capital of the Mughal Emperor. Later it was left as capital due to water scarcity and relationship with Rajputana neighbourhood. It was also known as ghost town during old times. The places to be visited in Fatehpur Sikri are the Buland Darwaza, Diwan-I-Khas, Jodhanai Palace, Tomb of Sheikh Salim Chisti, Jama Masjid, and Panch Mahal. 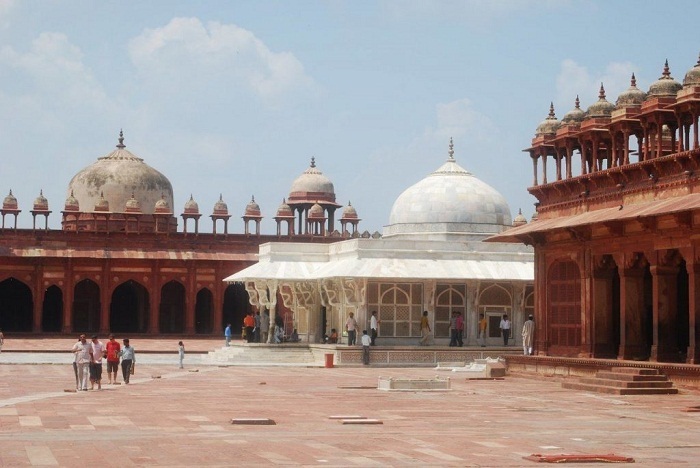 These are the different tourist spots should be visited when you visit Fatehpur Sikri. All these tourist places reflect the architectural style of Mughal Emperor. Entry Fee: 40Rs for Indians and 510Rs for Foreigners. Agra Fort is also a great iconic symbol of Mughal architecture by Akbar. Agra Fort was constructed by Akbar with red stone on the bank of the River Yamuna in 1565. This fort was used as military service during the times of Akbar and later Shah Jahan used this as palace and court. The monuments to be visited inside the Agra Fort is the Jahangiri Mahal( Jahangir’s Palace ), Khas Mahal, Musamman Burj( an octogonal tower ), Diwan-I-Khas( hall of Private audience ), and Diwan-I-Aam( hall of public audience ). These are the beautiful monuments inside the Agra Fort to be seen when you visit Agra Fort. Timings: 6:00 am to 6:00 pm every day. Entry Fee: 20Rs for Indians and 300Rs for Foreigners. No fee for Children below 15 years. 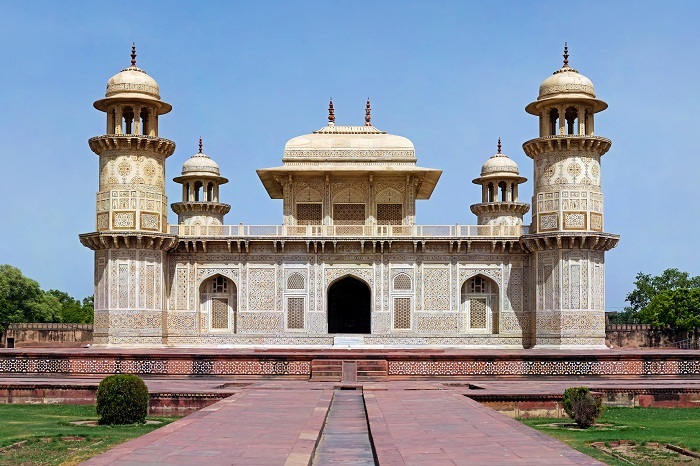 Itmad-Ud-Daulah is one of the famous Mughal architecture in Agra. 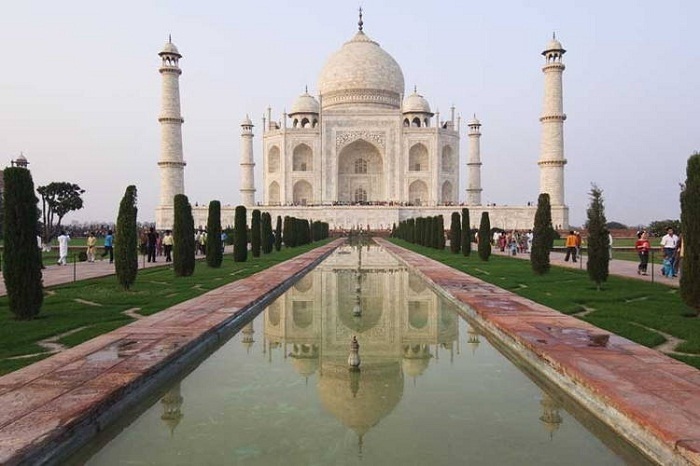 It was the first tomb in India which was built in completely with White Marble. This mausoleum depicts the architectural style of Islam. The use of octagonal shaped towers, arched entrances, carved floral patterns depicts the Islamic architectural style. This tomb was built after the death of Ghiyas Beg known as Itmad-Ud-Daulah who is the minister of Jahangir. This tomb was covered with a small garden on the bank of Yamuna River which attracts tourists. Timings: 6 am to 5:30 pm every day. Entry Fee: 10Rs for Indians and 110Rs for Foreigners. No Fee for children below 15 years. 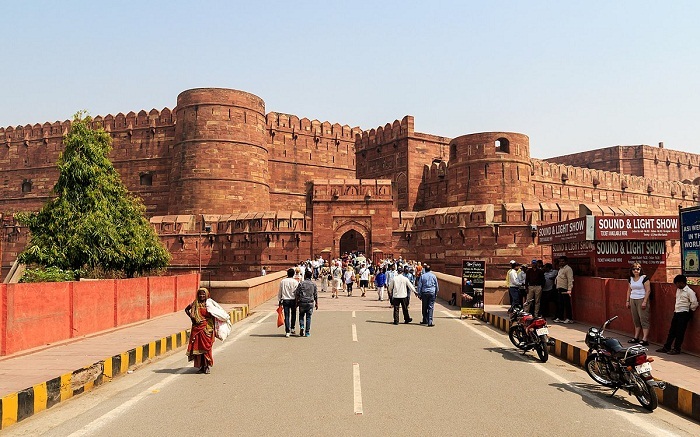 Sikandra is also one of the famous forts which is located near to Agra. Sikandra fort is the tomb of the great Mughal Emperor Akbar. This tomb is also one of the best examples of Mughal architecture and it was himself Akbar was started but it was completed by Jahangir by 1613. The main attraction of this fort is its architecture beautifully carved and built with red stone. The garden in this tomb is so pleasant to enjoy the sunset and herds of deer across the garden. Entry Fee: 10Rs for Indians and 110Rs for Foreigners.